This past month, the Clough Undergraduate Learning Commons has been dipped head to toe in the annual festival that is the Clough Art Crawl. Tech students from all majors and walks of life present their artistic masterpieces to the campus community, and some are awarded with actual honors in addition to general recognition. This year, graduate student Sean Tamblyn took home Best in Show for his multimedia sculpture piece Test Pattern; in light of this recent win, the Technique was able to pose a few questions to Tamblyn regarding the methods and meanings behind his work. Technique: First off, could you describe Test Pattern? What medium (or media) did you use in creating it? Tamblyn: A stained glass panel, made using copper-foil technique, forms the screen in a thirteen-inch television. 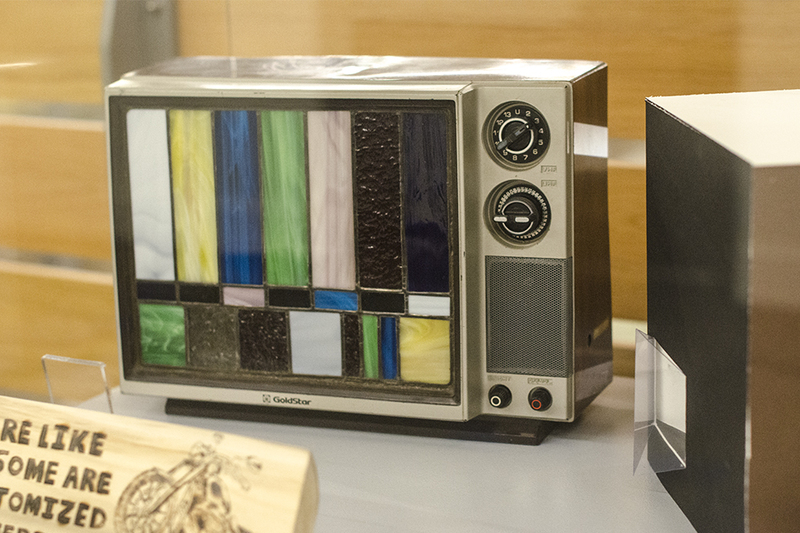 The pattern of the glass panel resembles color bars of a test-pattern standard, which was developed in the 1970s for adjusting video transmissions. Although most of the internal components of the television have been removed, the original rotary power switch still functions and is connected to a backlight for the glass panel. Technique: What would you say the meaning is behind your piece, and what effect did you hope it would have on your audience? Tamblyn: Following the analog to digital conversion for broadcast television, many older televisions were “obsolete” and discarded to make room for HDTVs with digital tuners. Also, my house was having problems with our cable provider and the customer service was very poor. Realizing that the cost of cable television easily exceeds $1000 per year, I cancelled our subscription and took up more constructive activities. Test Pattern is intended to be a “conversation piece”—a television that can be on in the background while people are having conversations (not necessarily about the piece). I hope that the audience will consider the time that they spend in front of televisions and other devices, and the cost of doing so. Technique: Have you created art pieces like this in the past? Tamblyn: Yes, I enjoy working with stained glass and finding unique ways to present it. It is a wonderful traditional art form, which should be applied beyond windows and lamp shades. Technique: Coming from a Management background, what inspired you to enter the Art Crawl? Tamblyn: I am currently in the MBA program, but I also finished undergrad from Tech (AE ‘06). During this time, I went on the summer study abroad trip “History of Art and Architecture in Italy.” I’m not entirely sure, but I think that it planted the seed for me to learn more about stained glass. Regarding the Art Crawl, it’s a great event and I wanted to participate and support it. There is so much creativity on campus and I think that students need more venues to express it. Technique: Test Pattern appears to have some electrical components in addition to its stained glass. Did you learn any of those techniques here at Tech? Tamblyn: When I took the original components out of the television, I found that the rotary power switch is rated for 120v AC and therefore could easily be adapted for my backlight to the glass panel. This was a simple connection—similar to wiring any household lamp. Technique: Do you see yourself producing more art in the future? Tamblyn: Yes, especially since we are moving to Cincinnati after graduation. Cold winters and a house with a basement are ideal conditions for me to produce art.